Santa: In my Yiddisha stocking, please insert a plane ticket to New Mexico, a reservation for a mobility device when I arrive, one $1,00 ticket and enough moolah to make a donation to HIAS,*, pay off my most demanding creditors before dancing the tango at the inaugural ball for Michelle Lujan Grisham, the wonderful new governor of New Mexico, who will embrace refugees from the horrors of central America as the Statute of Liberty recommends. I am so honored and excited to take office as Governor of New Mexico in just a little over a week. We’re about to begin a new chapter of our state’s history – and I can’t wait to get to work fighting for a brighter future for New Mexico’s families. I want to kick it off with the folks who made it possible over the last two years – including you! That’s why the inaugural committee is giving away five tickets to one contest winner to celebrate with me at the Governor’s Ball. This is a chance to celebrate all we’ve accomplished. It was a long, hard road to get to this historic night, and I want to honor the hard work and dedication of my team and my supporters. If you’d like to join me at the Governor’s Ball at 8 p.m. on January 1st in Santa Fe, you can donate any amount before midnight tomorrow to be automatically entered for a chance to win tickets for you and four of your loved ones. Click here to give ANY amount to enter our contest to win five tickets for you and your loved ones to celebrate this historic moment for New Mexico at the Governor’s Ball. P.S. If you don’t want to leave it to chance, you can click here to purchase a ticket to the Governor’s Ball before January 1st. Contributions or gifts to the Lujan Grisham Inaugural Committee are not tax deductible. No purchase, payment, or contribution necessary to enter or win. Contributing will not improve chances of winning. Void where prohibited. Entries must be received by December 23, 2018. Enter by contributing here, or click here to enter without contributing. One (1) winner will receive the following prize: five tickets to the Lujan Grisham Inaugural Ball (approximate retail value of prize: $500). Odds of winning depend on number of entries received. All prizes will be awarded. Promotion open only to U.S. citizens, or lawful permanent U.S. residents who are legal residents of 50 United States, District of Columbia, and Puerto Rico and 18 or older (or age of majority under applicable law). Promotion subject to Official Rules and additional restrictions on eligibility. 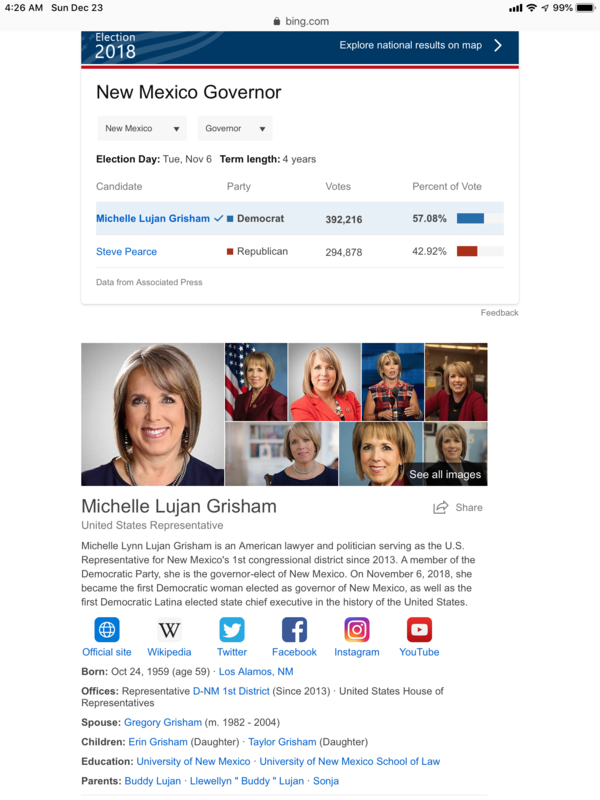 Sponsor: Lujan Grisham Inaugural Committee, P.O. Box 4700, Santa Fe, NM 87505.